AUSTRALIA’S only solar panel recycling company is looking to scale up production as the number of broken and end of life systems mounts. Adelaide-based Reclaim PV has teamed up with major solar panel manufacturers who distribute in Australia and is refining its processes as well as lobbying for panels to be included in recycling regulations. The company was started by Clive Fleming and David Galloway in 2014 and was spun out of Solar Maintenance and Renewable Technologies (SMART), which they launched in South Australia in 2011. “We saw the need for the maintenance of solar. We saw a lot of sales happening but not a lot of after sales stuff, there was a vacant space,” Fleming said. 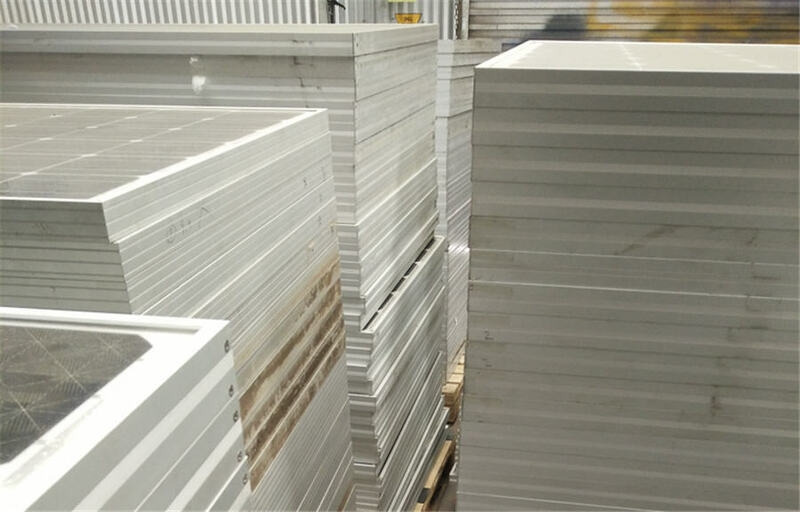 Recycled panels are not recirculated, they are dismantled using a Pyrolysis process developed to remove glues and recover glass, aluminium, solar cells and contacts. “We’re trying to value add to the cells so they can be reused – not as solar panels – but in new self powered products,” Fleming said. Solar panels generally have a 20 or 25-year warranty but a small percentage of the 23 million solar panels installed in Australia are damaged due to installation or transport handling faults, or develop new faults each year. Galloway and Fleming are working with the a leading Australian research facility to get more value out of the recycled solar cells and streamline the dismantling process. They conservatively estimate 100,000 to 150,000 panels a year need replacing in Australia. “It’s not as simple as finding solar panels that are broken and recycling them, there are undiagnosed systems out there and all these solar installation companies are now turning to servicing and that’s bringing in more diagnoses,” Fleming said. The Waste Electrical and Electronic Equipment (WEEE) directive regulates the treatment of electrical and electronic waste at the end of its life cycle in Europe. Solar panels were added to the directive in 2012. “PV Recycling in Europe have been recycling for seven or eight years so they’ve brought that awareness to these manufacturers who are operating in Australia as well as Europe,” Fleming said. Australian CleanTech Managing Director John O’Brien said official protocols around the recycling of PV solar panels would become increasingly important in the coming years as millions of panels came to the end of their useful life. "There’s a great business opportunity there if government signals that in good time,” he said. A report released in June predicts solar panel waste could total 78 million tonnes globally by 2050. The Australian Government’s National Television and Computer Recycling Scheme was established in 2011 to provide householders and small businesses with access to industry-funded collection and recycling services for televisions and computers. The regulations require importers and manufacturers of televisions, computers and computer products to fund and implement recycling of their products. Galloway said including solar panels in the regulations would be a great benefit. “We are looking for industry and government support at this point to reach a critical mass so the feedstock is enough to offset the costs,” he said. “It’s a new industry in Australia, the manufacturers see it as a cost, which it is, so we’ve got to work in with that. We’ve got to give them a value added service, which is why SMART is associated with it. Reclaim PV is refining its processes and hopes to establish collection and dismantling centres across Australia before the end of the year. The company will also continue to work with Tier One panel suppliers such as SunPower, Canadian Solar, Suntech, ReneSola and Yingli, with more manufacturers partnering soon. “It’s industry led at the moment, they know the problems and they know where it’s headed. It’s just a matter of getting it to the point where it can be facilitated on all fronts,” Galloway said. “We are setting up an industry stewardship, which will then hopefully lead in to a program that’s run by the government and also the legislative changes need to be made in each state as well. “We’re trying to set it up now so there’s an easy gradient into it so that when it becomes a big problem the infrastructure is there. South Australia leads the nation in the uptake of wind energy and rooftop solar with renewable sources accounting for more than 30 per cent of the electricity generated in the state.